IRAN. Imperial Bank of Persia. 100 Tomans, 1924-32. P-17. PCGS Fine 15 Apparent. Repairs and Restorations.PAYABLE ONLY AT ISFAHAN. Some Repairs and Restorations mentioned by PCGS in the comments section, but the note maintains an overall delightful appearance. Fully observable hand-written signatures in the signature panels with a printed date of June 28, 1924. Even margins and good registration observed throughout, with deep and vibrant inks. 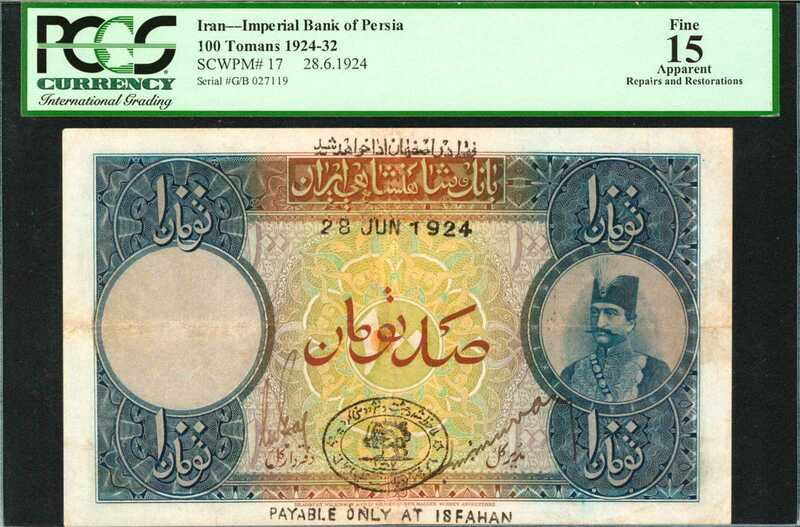 This note has added appeal to the typical Teheran issued notes in that it was Payable at Isfahan, an extremely difficult overprint to find in any denomination. This is the first 100 Tomans issued note for the type have offered, and only the 5th Isfahan issued note in any denomination form that we have auctioned, the last being the 50 Tomans in Fine to Very Fine condition that brought $18,800 in our January sale in 2016.From the Prestigious Collection of Dr. Magid Al-Kimawi.